The KBPB™ “Cycler” by KB Electronics is a variable speed drive for PM and Shunt DC motors through 3 horsepower. This chassis-style drive provides anti-plug instant reversing, rapid run brake cycling, and solid state dynamic braking. Features patented Overload and Reversing Circuit. 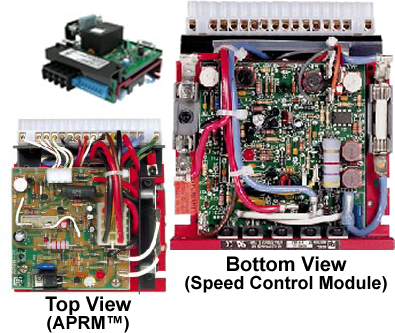 KBPB™ combines all features of the KBMM™ speed control with the features of the KB APRM®*. Eliminates contact arcing because the APRM®, which allows armature switching only when current levels are near zero. Also features a built-in barrier terminal block. The drive is compact in size for easy installation. Each KBPB™ model features KB’s exclusive Plug-in Horsepower Resistor®. With this feature, there’s no need for recalibration of the IR Comp and Current Limit when the control is used on various horsepower motors. KB’s Auxiliary Heatsink is included to enhance the basic ratings. The Inhibit™ feature allows for electronic switching of the armature voltage, while Auto Inhibit® allows for safe and rapid switching of the AC line. With the “voltage following” method, an isolated analog signal (0-9VDC) is applied to the input terminals P2 (+) and F (-). Adjustment trimpots are provided for MIN, MAX, IR COMP, CL ACCEL and DECEL. The KBPB™ drives have been in service since 1985 and provide excellent reliability and repeatability. call 1-888-286-8614 or e-mail us today! © 2016 Carotron, LLC. All Rights Reserved.